Home / CELEBRITY NEWS / Jennifer Lawrence and Bradley Cooper Reunite in "Joy"
Jennifer Lawrence and Bradley Cooper Reunite in "Joy"
Based loosely on the life and rise of inventor and home shopping star Joy Mangano, starring Jennifer Lawrence in the titular role for which she is nominated in the Best Actress category in this year’s Academy Awards, the genre-blurring story of “Joy” follows the wild path of a hard-working but half-broken family and the young girl who ultimately becomes its shining matriarch and leader in her own right. Driven to create and take care of those around her, Joy experiences betrayal, treachery, the loss of innocence and the scars of love. Ultimately, she finds the steel and the belief to follow her once-suppressed dreams. The result is an emotional and human comedy about a woman’s rise – navigating the unforgiving world of commerce, the chaos of family and the mysteries of inspiration while finding an unyielding source of happiness. Outside of Joy’s family, her biggest ally – and later her greatest business rival – is QVC executive Neil Walker, portrayed by long-lived David O. Russell collaborator Bradley Cooper, an Oscar® nominee for Silver Linings Playbook and American Hustle as well as Clint Eastwood’s American Sniper. Cooper and Russell talked about bringing a dash of early Hollywood mogul to the character, having Cooper explore an easy flair and optimism new to their work together. 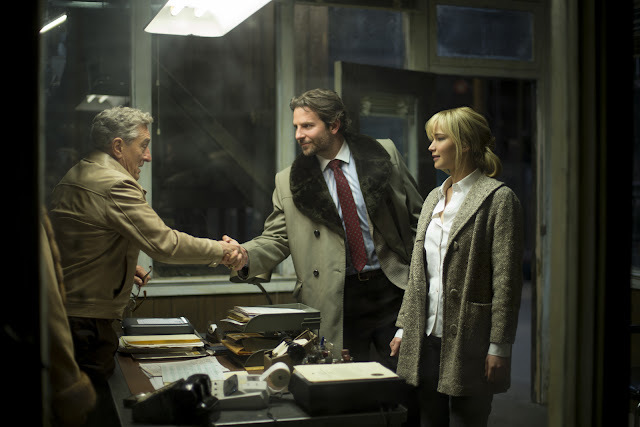 “Joy” opens February 17 in cinemas from 20th Century Fox to be distributed by Warner Bros.